Being the more expensive and abused part of a drum set, cymbals must get the proper care they deserve. After all, no one wants to be replacing their cymbals very often especially if you have expensive Sabian or Zildjian Cymbals. Everything from wing nut tightness, to angling your cymbals makes a big difference. Remember, you are beating the snot out of a thin piece of metal with a stick; there will be stress on the cymbal. So be sure to follow these simple tips to keep your cymbals shimmering, and sounding great. Let’s start with keeping your cymbals clean. The number one source of dirt on your cymbals is finger prints. Although your fingers may look clean, they are covered with oils that will eventually harm your cymbals. 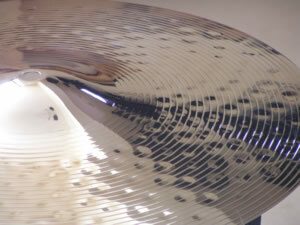 Every time you choke you cymbals, or transport them, you are covering them with finger prints. Fortunately, this can easily be cleaned. There are many products out there for cymbal cleaning. Groove Juice is a spray on cleaner that polishes well and will only cost you around 10 bucks. However, I have heard of people using around the house brass cleaners as well. Some people say some products will remove the metal and destroy your cymbals. This is not true, the metal it removes is miniscule, and will not damage your cymbal. Be sure to be careful with the polish you use – most are corrosive and can irritate your skin and/or damage your clothes. Another tip to keep in mind is the angle of your cymbals. Make sure you are not striking your cymbals at the wrong angle; this will cause excess stress that will eventually damage your cymbal. For your crash cymbals, start with them at a 90 degree angle –from there adjust it downwards 20 or so degrees. You do not want to have it too tilted or you won’t get a powerful enough hit. Not enough angles will hurt your cymbal, as well as damage your sticks. Ride cymbals are usually thicker and can take more abuse. Besides, most rides are played with the tip of the stick, so stress is not usually a factor. Wing nut tension is usually overlooked by drummers. This is the screw that you tighten overtop of the felt on your cymbal stand. Before I go any further; make sure you have 2 felts on each stand. One underneath and one on top of the cymbal. This is very crucial, as it will act as a cushion and absorb a lot of energy that usually harms the cymbal. With this in mind, you do not want to tighten your wing nuts to much. Cymbals emit their sound by vibrations, and if you have it on too tight, you will restrict its’ movement. A tight wing nut allows the outer edge to vibrate, while permitting the inner bell to move at all. This causes unneeded stress to the center, which may crack your cymbal! On the flip side, too loose a wing nut will allow too much movement; which will shorten the life of a cymbal drastically. So be sure to keep them nice a snug. Whether you’re traveling to a gig’ or storing your cymbals, remember these basic rules. Never leave them standing upright. Cymbals that are left leaning upright will put a lot of gravitational force on the bottom, and will eventually cause warpage. Always store them laying down on a padded surface. If you are storing more than one, do not place them on top of each other unless you have a cloth like material between them. When transporting, never leave them on their stands. Cymbal bags are a must for any traveling drummer. The investment is well worth the safety for your cymbals. Following these simple steps will maximize the life of your cymbals. Always remember to keep the wing nuts at the right tension, as well as the cymbals at the right angle. Also, keep in mind not all people like to clean their cymbals, some like the sound of nice clean cymbal, others swear by the sound a dirty cymbal gives. It’s up to you, and your style. Looking for information on how to select good cymbals or more advice on how to take care of your cymbals? Visit howtoplaydrums.com.